The Hoya 82mm HMC 80C Light Balancing Filter is uniform in color and with a mired shift value of -81, can be applied to purposely create a cool cast over an entire image. This effect can be obtained under daylight when this filter is used on a film camera system with daylight film installed, or on a digital camera system with its daylight white balance setting selected. 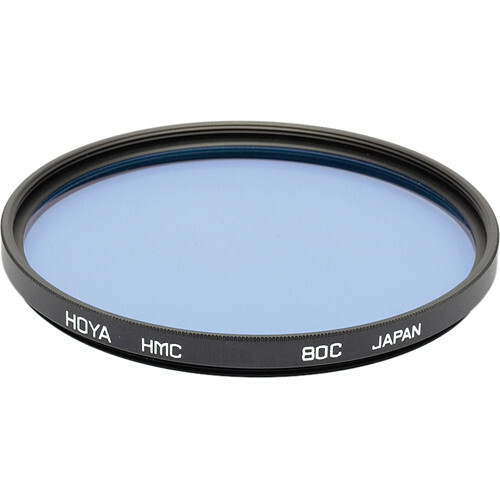 The Hoya 82mm HMC 80C Light Balancing Filter is also useful for balancing light sources with a color temperature of 3800K for daylight film, which is designed to accurately reproduce colors under 5500K light sources. The greater the difference between the color temperatures they are designed to correct for under 5500K, light balancing filters for daylight film are considered to be progressively stronger in their effect when used to cool a daylight image. This filter is constructed from optical glass for increased clarity and color fidelity. Its aluminum-alloy filter ring is durable while remaining lightweight. To prevent internal ghosting and reflections, each glass surface includes three layers of anti-reflection coating. These coatings also offer greater protection to the filter substrate and help it to stay clean for longer than with uncoated filters. When used, the Hoya 82mm HMC 80C Light Balancing Filter's 0.3 density darkens the entire image by 1 stop. This reduction in exposure can be compensated for by adjusting the aperture setting of the lens it is placed on, or the shutter speed of the camera being used.